The classic sonnet “Ozymandias” by Percy Bysshe Shelley has within it two stark ironies. Can you discern them both? While Ozymandias tells the mighty trailing him in history to despair at the unreachable loftiness of his works, in fact all that remains of the arrogant pharaoh is a shattered statue bereft of majesty. The rulers following him should indeed despair, not through their inability to equal his glory but rather by realizing they too are destined for obscurity, as Ozymandias is, by the ravages of time. A second irony stems from the notion that Ozymandias’ place in history is sealed not by the permanence and grandeur of the monuments that he erected, but by the fact that their decay is extreme enough to have caught the eye of the nameless author, whose simple tale of Ozymandias’ ruin will remain when all physical sign of once powerful king is forever gone. Ozymandius is widely considered to be Ramses II, the 13th century BC pharoah who ruled Egypt for 67 years. The historical mark he left upon his country is unrivaled by any other pharoah, and is measured in the archaelogical record by buildings, temples and statues. One of Ramses’ principal icons, known now as the Ozymandias Colossus, would have towered 50′ were it still standing. As it is, the toppled colossus is broken and in decay, and is thought to have inspired Shelley in the penning of his sonnet. 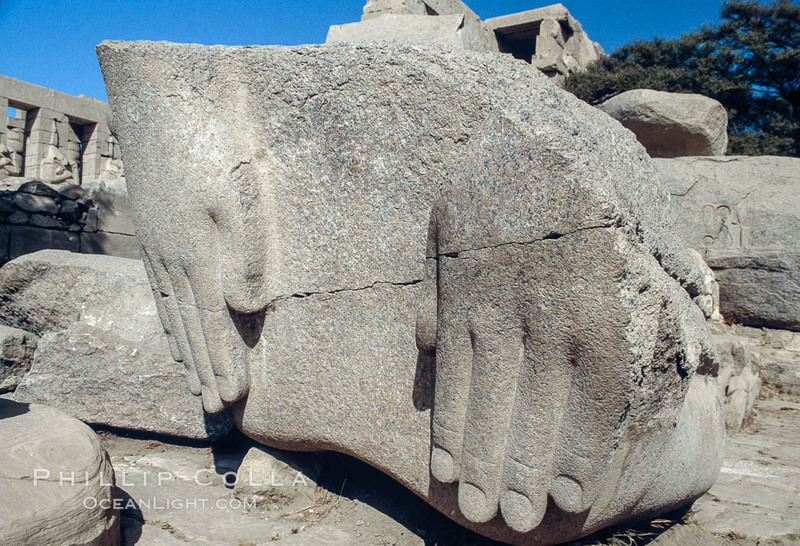 You can find the Hands of Ozymandias for yourself at the Ramesseum, the mortuary temple complex for Ramses II that is part of the sprawling necropolis of ancient Thebes, located across the Nile River from modern-day Luxor, Egypt.